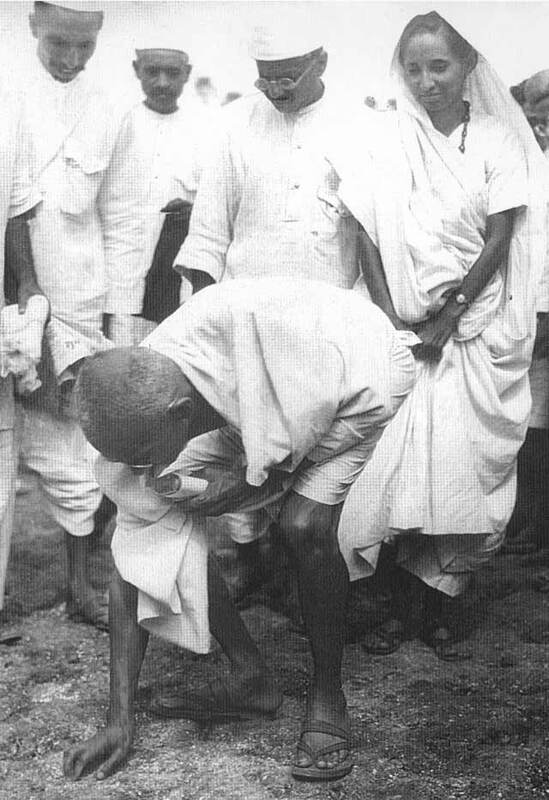 Gandhi picked up grains of salt at the end of his march. Behind him is his second son Manilal Gandhi and Mithuben Petit. The Salt March, also known as the Dandi March and the Dandi Satyagraha, was an act of nonviolent civil disobedience in colonial India led by Mohandas Karamchand Gandhi to produce salt from the seawater in the coastal village of Dandi (now in Gujarat), as was the practice of the local populace until British officials introduced taxation on salt production, deemed their sea-salt reclamation activities illegal, and then repeatedly used force to stop it. The 24-day march lasted from 12 March 1930 to 6 April 1930 as a direct action campaign of tax resistance and nonviolent protest against the British salt monopoly. It gained worldwide attention which gave impetus to the Indian independence movement and started the nationwide Civil Disobedience Movement. Mahatma Gandhi started this march with 78 of his trusted volunteers. Walking ten miles a day for 24 days, the march spanned over 240 miles. Gandhi led the Dandi March from his base, Sabarmati Ashram, 240 miles (384 km) to the coastal village of Dandi, which was at a small town called Navsari (now in the state of Gujarat) to produce salt without paying the tax, growing numbers of Indians joined them along the way. When Gandhi broke the salt laws at 6:30 am on 6 April 1930, it sparked large scale acts of civil disobedience against the British Raj salt laws by millions of Indians. The campaign had a significant effect on changing world and British attitudes towards Indian sovereignty and self-rule and caused large numbers of Indians to join the fight for the first time. After making salt at Dandi, Gandhi continued southward along the coast, making salt and addressing meetings on the way. The Congress Party planned to stage a satyagraha at the Dharasana Salt Works, 25 miles south of Dandi. However, Gandhi was arrested on the midnight of 4–5 May 1930, just days before the planned action at Dharasana. The Dandi March and the ensuing Dharasana Satyagraha drew worldwide attention to the Indian independence movement through extensive newspaper and newsreel coverage. The satyagraha against the salt tax continued for almost a year, ending with Gandhi's release from jail and negotiations with Viceroy Lord Irwin at the Second Round Table Conference. Over 60,000 Indians were jailed as a result of the Salt Satyagraha. However, it failed to result in major concessions from the British. The Salt Satyagraha campaign was based upon Gandhi's principles of non-violent protest called satyagraha, which he loosely translated as "truth-force". Literally, it is formed from the Sanskrit words satya, "truth", and agraha, "insistence". In early 1930 the Indian National Congress chose satyagraha as their main tactic for winning Indian sovereignty and self-rule from British rule and appointed Gandhi to organise the campaign. Gandhi chose the 1882 British Salt Act as the first target of satyagraha. The Salt March to Dandi, and the beating by British police of hundreds of nonviolent protesters in Dharasana, which received worldwide news coverage, demonstrated the effective use of civil disobedience as a technique for fighting social and political injustice. The satyagraha teachings of Gandhi and the March to Dandi had a significant influence on American activists Martin Luther King Jr., James Bevel, and others during the Civil Rights Movement for civil rights for African Americans and other minority groups in the 1960s. On 12 March 1930, Gandhi and 80 satyagrahis, many of whom were from scheduled castes, set out on foot for the coastal village of Dandi, Gujarat, over 390 kilometres (240 mi) from their starting point at Sabarmati Ashram. The Salt March was also called the White Flowing River because all the people were joining the procession wearing white khadi. According to The Statesman, the official government newspaper which usually played down the size of crowds at Gandhi's functions, 100,000 people crowded the road that separated Sabarmati from Ahmadabad. The first day's march of 21 kilometres (13 mi) ended in the village of Aslali, where Gandhi spoke to a crowd of about 4,000. At Aslali, and the other villages that the march passed through, volunteers collected donations, registered new satyagrahis, and received resignations from village officials who chose to end co-operation with British rule. As they entered each village, crowds greeted the marchers, beating drums and cymbals. Gandhi gave speeches attacking the salt tax as inhuman, and the salt satyagraha as a "poor man's struggle". Each night they slept in the open. The only thing that was asked of the villagers was food and water to wash with. Gandhi felt that this would bring the poor into the struggle for sovereignty and self-rule, necessary for eventual victory. Thousands of satyagrahis and leaders like Sarojini Naidu joined him. Every day, more and more people joined the march, until the procession of marchers became at least two miles long. To keep up their spirits, the marchers used to sing the Hindu bhajan Raghupati Raghava Raja Ram while walking. At Surat, they were greeted by 30,000 people. When they reached the railhead at Dandi, more than 50,000 were gathered. Gandhi gave interviews and wrote articles along the way. Foreign journalists and three Bombay cinema companies shooting newsreel footage turned Gandhi into a household name in Europe and America (at the end of 1930, Time magazine made him "Man of the Year" . The New York Times wrote almost daily about the Salt March, including two front-page articles on 6 and 7 April. Near the end of the march, Gandhi declared, "I want world sympathy in this battle of right against might." I cannot withhold my compliments from the government for the policy of complete non interference adopted by them throughout the march .... I wish I could believe this non-interference was due to any real change of heart or policy. The wanton disregard shown by them to popular feeling in the Legislative Assembly and their high-handed action leave no room for doubt that the policy of heartless exploitation of India is to be persisted in at any cost, and so the only interpretation I can put upon this non-interference is that the British Government, powerful though it is, is sensitive to world opinion which will not tolerate repression of extreme political agitation which civil disobedience undoubtedly is, so long as disobedience remains civil and therefore necessarily non-violent .... It remains to be seen whether the Government will tolerate as they have tolerated the march, the actual breach of the salt laws by countless people from tomorrow. The following morning, after a prayer, Gandhi raised a lump of salty mud and declared, "With this, I am shaking the foundations of the British Empire." He then boiled it in seawater, producing illegal salt. He implored his thousands of followers to likewise begin making salt along the seashore, "wherever it is convenient" and to instruct villagers in making illegal, but necessary, salt.